Nineteen members of St. Martin’s Episcopal Church, Williamsburg VA will travel to the Holy Land April 28-May 11, 2019. We will join with other pilgrims from around the world, participating in the “Footsteps of Jesus” course at St. George’s College, Jerusalem. We have been preparing as a community for several months, joining the company of millions of pilgrims who have gone before us. It is a privilege to walk the land with our spiritual forebears. Please share our journey here. One of my ancestors has gone missing. A thread that runs through my maternal line dropped a stitch three generations ago, and a 23-year-old girl dropped from sight. She disappeared from the family radar in 1920, and I have become obsessed with finding her, 100 years on. I know the story well, because I grew up hearing it from my maternal grandmother, Minerva Bone Flanigan. Minerva’s mother-in-law, Gladys Callaway Flanigan (1889-1952) had two sisters, Elaine (1893-1980) and Wilda, born 1897. Wilda dropped off the face of the earth after her mother Lula’s funeral in Marshfield MO in 1920; the funeral announcement says among those present was “Miss Wilda Callaway of Kansas City.” The 1920 Kansas City directory lists her as a stenographer with something called Smith, McCord and Townsend Dry Goods. I do not find her in subsequent city directories. The story I heard many times from my grandmother–a story told in almost exactly the same words no matter who is telling it–is that Wilda “ran off with a married man” and, as a consequence, was shut out of the family. The rejection seems to have been complete: Wilda does not appear in the obituaries for her father George, or her sisters Gladys and Elaine. She is not mentioned in the eulogy at Gladys’ funeral. I infer from family lore that Wilda got married at some point, although that is not necessarily so. My daughter and I have exhausted every online resource we know: all the major genealogical websites and services as well as state and federal census records, newspaper articles, and city directories. I have joined family genealogical groups. We’ve dug up a lot of dirt, but no Wilda. In every family there is a box or boxes full of family papers, photos of people whose names are long-forgotten, newspaper clippings and such. Lucky descendants may have durable goods, as well: a button hook, an inkwell, a great-grandfather’s doctor bag. Somebody in the family keeps these boxes in their attics. But who are the appropriate keepers of the non-physical things: the memories and the mythology? Is family lore intellectual property; does somebody own it? Who gets to tell the stories, and do different family members get to tell the stories differently? And why do some offenses get punished and some do not? Was Wilda’s offense worse than, say, her father’s, who in our research we found (also) ran off with a woman not his wife? I am pretty sure black-sheep-hood is in the eye of the beholder. History is, as they say, written by the victors. What is the cost, down through the generations, of leaving family mythologies unchallenged? The entire communion of saints lives on in the heart of God. Nothing is ever lost. I keep thinking about the potential for the spiritual healing of some of the broken memories in my family. It is a profound experience to be working on this project with my own daughter. I would love so much to be able to reach across the barriers of years, pridefulness, and scandal to find out what happened this woman who was our flesh and blood. O Wilda, where art thou? As we round the corner into November, it is stunning—as always—to grasp the passage of time. November brings that unique day which, for people of faith, combines politics, outreach and stewardship: Election Day. 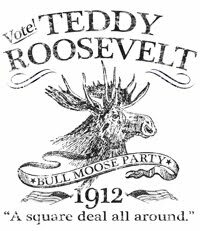 My husband and I recently finished watching the Ken Burns film The Roosevelts. It was stirring and educational and I found myself longing over and over that I could vote for any of them: Teddy, Franklin or Eleanor. Their words and their actions were an inspiration, after all these years, even though I have so little in common with them. But that was their genius, each of them: even the most common folk felt that TR, FDR and Eleanor knew them. On the other hand, there is one thing I do share with all three Roosevelts, the Episcopal Ch urch. Official Episcopal policy recognizes voting and political participation as acts of Christian stewardship. “A faithful commitment to political participation aligns with our Baptismal Covenant’s promise to ‘strive for justice and peace and respect the dignity of every human being, ‘” says the Episcopal Church’s Office of Government Relations. Our wonderful democracy is not simply a static form of government, it is dynamic. The Word of God is dynamic and alive, and is always calling us to engage with what my friend Br. Curtis calls “the least, the last, and the lost.” Vote your faith. Vote your heart. Vote. PS: If you need help knowing what’s going on, Google your state’s Department of Elections. Also let me recommend one of my favorite spiritual Internet resources, Spirituality & Practice, which has a new spiritual resource called The Practicing Democracy Project. I want to do something a little different today. In the spirit of Blessed Vincent of Green Bay, I’d like to review some fundamentals. I do not want to preach on the lessons, per se, but do a little pastoral tending for our hearts. It has been said that a preacher should preach with a Bible in one hand and a newspaper in the other. As the news seems to worsen, and the world feels more chaotic every day, we feel shock and grief, helplessness and loss. Disaster and violence—caused by nature and by human beings—these things are pressing in on us. There is no end to the questions we ask ourselves and each other. I have these conversations every day, as do you: what is happening? How could these things happen? What has come over us? What’s to become of us? What can we do to make a difference? We are the body of Christ, a part of God’s great and powerful network of love. This is our identity, this is who we are. And what do we do? We Gather. We Pray. We Serve. First: Gather. We come together as a community—we are here today—to remind ourselves that we are God’s body on earth. We bring our hard hearts and our losses and our joys…we don’t come here to be churchy. We bring our authentic selves. As the Eucharistic prayer says, we bring our selves…our souls and bodies to this place. Our worship has a pattern. And every time we come together we are following this pattern: we gather, we hear Scripture and some kind of elucidation of it, like a sermon or a discussion. Then we confess, come to the table to be fed, and then go out to “love and serve the Lord”, to do the work God has given us to do. And then we come back and do it all over again. This is our pattern, we make it our habit. We gather to remind ourselves and one another that God is with us. The kingdom of heaven is here, among us, and we draw strength from gathering. The Greek word for church is ekklesia, and it means “assembly,” it does not mean “building.” From the earliest days, the “church” has been understood to be the people. Us. Now, when I say one of the fundamentals is to gather, I’m not speaking only of “going to church.” I am saying we need to be with others…stay together…get together. Have dinner and lunch with people you love around tables and on patios and in living rooms. All meal fellowship is Eucharist. The faith is not some intellectual exercise, it is a practice of inviting God into our despair and into our joy. The faith is a practice. Good habits get us through bad times. Unlike what you hear from some Christians, the practice of the faith is not a matter of being “saved” once and for all, and it is certainly not about one day arriving in heaven. The Apostle Paul tells us today that it is a long race, “I am straining forward to what lies ahead, I press on toward the goal.” We do not have any expectation of arriving. Our work is to press on toward the goal. And by the way: Your faith is not supposed to make your life easy. Anybody who tells you otherwise is selling something. My second fundamental is this: while we are pressing on, we Pray. Rabbi Harold Kushner, in his wonderful “Nine Essential Things I’ve Learned About Life” says this: “Prayer, as I understand it, is not a matter of begging or bargaining. It is the act of inviting God into our lives so that, with God’s help, we will be strong enough to resist temptation and resilient enough not to be destroyed by life’s unfairness.” We pray—whether with words or silence or music—so that we will be changed, and soothed, and strengthened. I sent a note this week to the parish, inviting you to pray the psalms of lament. This is a worthy practice these days. God understands lament. Every prayer that goes something like “ARE YOU KIDDING ME? ?” is just as valid as any other prayer, and maybe more authentic. Anne Lamott says there are three main types of prayer: “Help, thanks, and wow.” Be authentic in your prayer. God can handle it. Theologian Jim Wallis says: “When I was growing up in my Christian world, I was told the greatest battle of our time is between belief and secularism. But I now believe that the real battle is between cynicism and hope.” Prayer—even something as simple as sitting quietly and opening your heart to God—gives us hope, reminds us not to despair. Which brings me to my third and final point in our review of the fundamentals. (The first were Gather and Pray.) The third is: Serve. We come for strength and renewal, so that we can go out to do the work God has given us to do. The dismissal at the end of our service is not just a nice turn of phrase. It is a charge, an exhortation: Go in peace to love and serve the Lord. God is not a guy who lives in buildings, or on a cloud somewhere. God is also a verb: a moving, loving force, and we are charged with spreading that love and being a part of that force. William Temple was the Archbishop of Canterbury during World War II, another time when everything seemed to be going to hell in a handbasket. Bishop Temple said, “The Church is the only society that exists for the benefit of those who are not its members.” In other words: get out there and help heal the world. Slow down. Remember to breathe. Turn off the news. Our practice of the fundamentals matters. We gather. We pray. We serve. What you do matters. It does. We don’t ever get there. Not in this life anyway. This life, this faith, is all about straining forward and pressing on. And we encourage ourselves and each other to keep going. Let us pray. O God, you have bound us together in a common life. Help us, in the midst of our struggles for justice and truth, to confront one another without hatred or bitterness, and to work together with mutual forbearance and respect; through Jesus Christ our Lord. Amen. The hero’s supernatural encounters are, clearly, not always “fabulous” in a good way; it is obvious that not all supernatural forces are benign. There are myriad examples of evil forces in the battle of Good vs. Evil, but I am thinking of three which seem particularly apt. Before CS Lewis’ White Witch goes to battle with Aslan and the true Narnians, she assembles her followers, among them Hags, Ogres, Boggles and Werewolves. When JRR Tolkien’s wizard Saruman seeks to destroy Middle Earth, his army consists of the slimy and bred-for-war Orcs as well as the flying, undead Nazgûl. And then there is JK Rowling’s Voldemort, the Dark Lord. When Voldemort is finally restored to human form, he gathers to himself a host of Death Eaters, Dementors, and (these guys again!) Werewolves, among others. Common among all of all evil forces, besides a taste for murder, is the emotional violence they unleash. One has had a sense of the worrisome seriousness of the situation, but then the day comes when Evil Itself swarms or swoops or rises up from the sewers in its full malignity. It is only then that the good guys realize what they are truly up against, and, dangerously, start to lose hope. We who read the story or watch the scene on the screen share this loss of hope, the despair, and the emerging, horrifying conviction that all is lost. We feel sick. Here’s why I bring this up, just in case it isn’t obvious. Like many, the above paragraph is a pretty accurate description of my emotional state in recent months. Maybe for you as well. (If not, God bless you. Please reach out to us.) But the wondrous thing is that as soon as I realized the source–the archetypal truth–of my emotions, I began to calm down. We may feel sick, but Orcs and giant snakes are not, in fact, about to feed on our flesh. We are not about to be turned into stone; we are not back-to-the wall in a cavern, soon to be torn limb-from-limb by a broadsword. That’s good news, no?! There is, of course, the bad news. Gandalf is not going to ride in on his magical horse Shadowfax, driving the darkness back. Aslan is not coming to save us. But there is this. There is this. Harry Potter was thrilled to think that his father had come to save him just when the Dementors were sucking his soul away. Just in case you haven’t read the story, suffice it to say that in a very complicated turn of events, it turns out that it was Harry himself who wielded the power, who cast the spell, saving himself. You have the power to do good. You may be wandering in the dark forest and afraid you are lost forever. But remember that Campbell’s archetypal hero always gets lost and despairs but then fights himself (herself) and keeps going. Even better, for people of faith, hope and life are restored in a mystical combination of human effort and divine grace. Do not despair. See the good. Be the good. Be kind to yourself. Be kind to others. Be a hero. Summon your own Patronus. Do justice. Love kindness. Walk humbly with your God.